By Xah Lee. Date: 2017-06-10 . Last updated: 2017-09-01 . 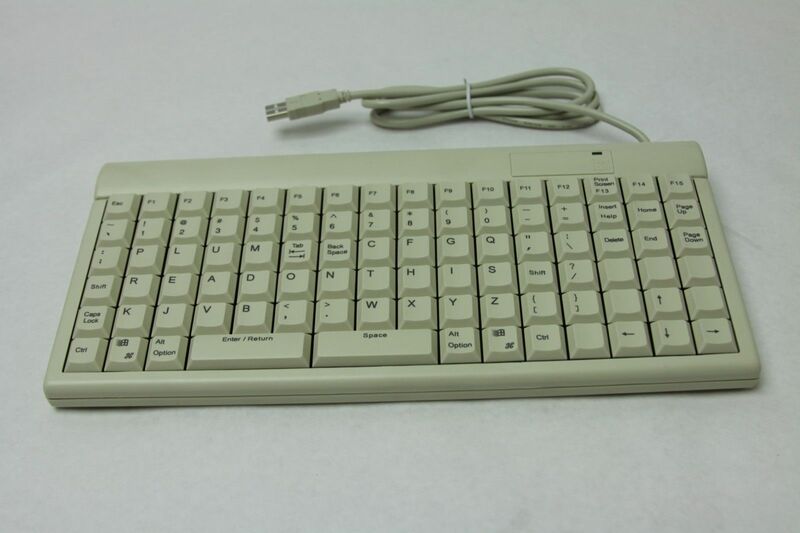 The Plum keyboard is created in 2005, by Debra Woods, and sold via her company Plum, LLC. The keyboard is designed for easy-learning of touch-typing. The letters P L U M on the top left row of the keyboard. The home row spells R E A D O N T H I S.
The Shift key is on the home row. Tab and ⌫ Backspace key are near the middle, top row. Overall, i think this is a very good design. Even though it didn't focus on typing efficiency by putting most frequently used letters to most easy finger positions, but one can see that aspect is not ignored. The first few most used English letters E T H A N I O, are all on home row. The position of ⌫ Backspace is a major improvement from QWERTY. Tab position is also improved. Moving the punctuation comma , and period . to middle bottom, is remarkable, as they are 2 most difficult key spots, for the least used symbols. And the even more rarely used semicolon ; is moved out of main touch-typing area. 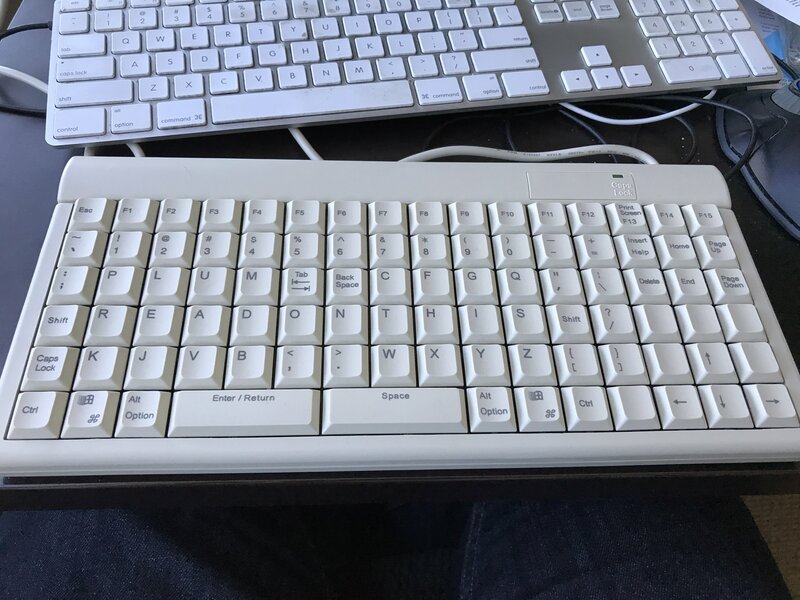 Considering that the plum keyboard is invented in 2005, and has all the features of today (2017) ergonomics keyboard innovations, it is quite remarkable. WOODBRIDGE, VA, February 15, 2005 -- Connecticut high school students will be among the first in the nation to test the new PLUM keyboard, which offers an easier approach in learning touch-typing. PLUM, which takes its name from the first four letters on the top row of the keyboard, has a new layout which some describe as 'PLUM easy' to remember. Debra Woods, the developer of the new keyboard and president of Plum, LLC of Woodbridge, VA, said students in the Electronics Technology department at Henry Abbott Technical High School in Danbury, CT will be given the opportunity to use the new PLUM keyboards under the supervision of Kevin Cooper, technology coordinator. In addition to the PLUM keyboard, the students will receive a Typing Manual and a Computer Tutorial. According to Woods, the PLUM keyboard updates the standard QWERTY keyboard (named for the first six letters of the top row), which was invented more than 130 years ago (1868) by Christopher Latham Sholes. While QWERTY was designed to slow down the typist because fast typing would jam the keys on an old typewriter, she said PLUM is designed for today's user. The PLUM keyboard places the most widely used keys in strategic locations on the keyboard, within easy reach of the user. As a result, the keyboard is easier to use and creates less physical strain on the typist. The keys are located in horizontal and vertical rows, rather than at angles or off to the sides. The layout includes easy to use words with 10 of the most often-used letters on the home row (READ ON THIS). Also, the Return, Tab, and Backspace keys are relocated to the center of the keyboard for easy access. Woods said the keyboard's compact size, 13 inches by 6 inches, is another plus, making it five inches shorter than the standard keyboard, thus allowing the mouse to be placed closer to the keyboard. As Electronics Technology Department Head, Cooper said he is interested in testing new technology. He has 20 students who are not proficient in typing on the standard QWERTY keyboard participating in the project. At the end of the semester, Cooper plans to compare the skills of the PLUM users with those of the QWERTY users. Cooper said an advantage of the PLUM keyboard is that it is easier to remember the keys' placement and once that skill has been mastered, students can then improve on their speed and accuracy. He added that students will use the PLUM keyboard in all of their classes' even taking them home to complete assignments. 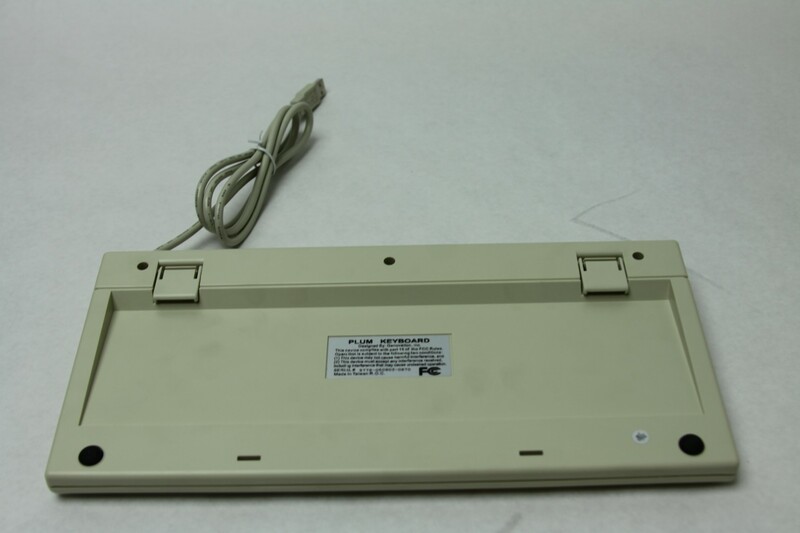 Another advantage is that the keyboard comes with a USB connector plug and play that can be used with most computer operating systems. There is no need for additional software or to disconnect another keyboard. With PLUM, Woods solves the problems beginners have in trying to master the keyboard and eliminates future hand, wrist, and finger fatigue as experienced by QWERTY users. She developed the PLUM keyboard in 1999 so learning to type and typing itself can be done in the easiest possible format. Woods added that the company is looking for other school systems or groups to test the PLUM keyboard. She said there are grants available through the Enhancing Education Through Technology program, a part of the No Child Left Behind Act, that assists schools in integrating new technology. For more information, contact Woods at (703) 507-2211, email: info@plum.bz or visit the website at www.plum.bz. Note: The PLUM keyboard retails for $49 (US) and is available from www.plum.bz. To schedule an interview with Debra Woods, please contact Andrea Burney, AJB Public Relations, at (434) 770-7990 or email msprpro@mindspring.com.